Gregory Rosenthal joined us October 19th, 2015 to share his research into the early days of San Francisco. He started out as a scholar of China — but was looking for a place that China and the U.S. connected and landed upon Hawaii. Kapalakiko — the transliteration of San Francisco in Hawaiian — was one node of a large Hawaiian diaspora in the mid to late 1800s. Hawaiian’s worked all around the Pacific — the large majority as whalers, in the arctic (where they were — perhaps unexpectedly — reliably the best workers), gathering guano, and active as workers and boatmen in California, with large numbers working the gold fields of California (Sutter had 10 Hawaiians in his employ). This all evidenced by a number of Hawaiian language papers that were in circulation throughout the Pacific — which served as an important source of material for Gregory’s research. 90% percent of Hawaiian’s were literate in Hawaiian, and the papers served to connect the population that spread out over such large distances. The 1860 census of San Francisco found that Hawaiians were the largest population next to whites. They weren’t just workers though — they were also landowners — although along with Mexicans — many had their land confiscated over time. While they were literate in Hawaiian — the “kanaka” — the term used for Hawaiian workers — weren’t necessarily literate in English and their employers often used this to their advantage (writing contracts in English without fully disclosing their contents). He’s worked to bring their names back and humanize their story — helping to make San Francisco what it was from the very beginning. Architect Glenn Lym will speak and show off parts of the 3D CAD model he’s been working on of early SF topography, roughly 1850 through 1890. Talk includes short video of the history of GG Park. 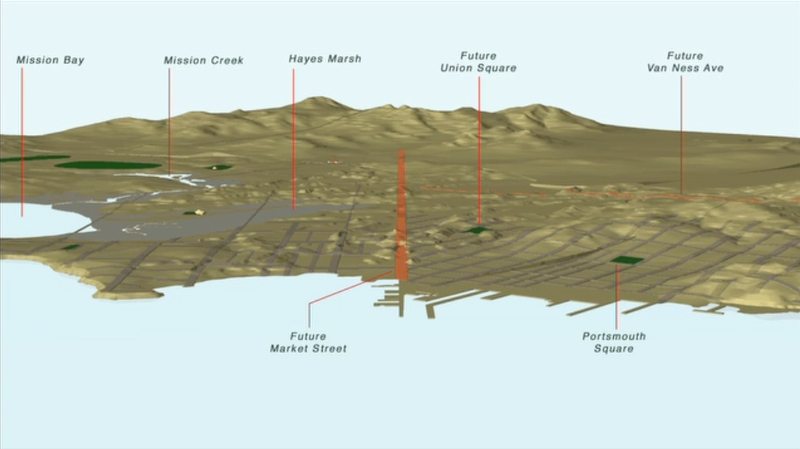 Glenn will begin with a look at the history of Golden Gate Park through a 20 minute video, and will move on to a live presentation of material related to the development of Market Street — how the the flatlands of SoMa, Union Square and the Tenderloin and were created. Materials include period photography, current and CAD based videos. More about Glenn on his website.